World-ranked for Masters in Finance by the Financial Times, this degree is widely regarded as one of the leading applied finance programmes in Europe. It has been specially designed with the support of industry practitioners to equip you with the skills and knowledge needed to succeed in the challenging field of international securities and investment banking. It enables our graduates to acquire the practical skills and knowledge sought by employers in the sector through a unique combination of interactive, technically advanced teaching and hands-on training. It is our longest established programme with over 2,500 alumni around the world. It is also the most flexible finance programme with a choice of over 20 elective modules, providing a broad expertise to equip those who have yet to settle on a specialism, and who look to a wider choice of potential career paths. You will benefit from exposure to advanced analysis tools and resources valued by the financial markets that aim to enhance your practical skills and market awareness. As part of the programme, you will gain an in-depth understanding of the operations of financial markets, securities trading, corporate transactions, valuation, investment strategies and quantitative techniques. Those who graduate in ISIB will leave us well equipped to pursue a wide range of careers in financial services. Many join investment banks to train as financial markets professionals in trading, sales and research, whilst others specialise in complex derivative products and others join brokers and commodity bankers. In addition, many graduates follow other career paths including consultancy, accountancy, operations, IT, and higher education and doctoral research. 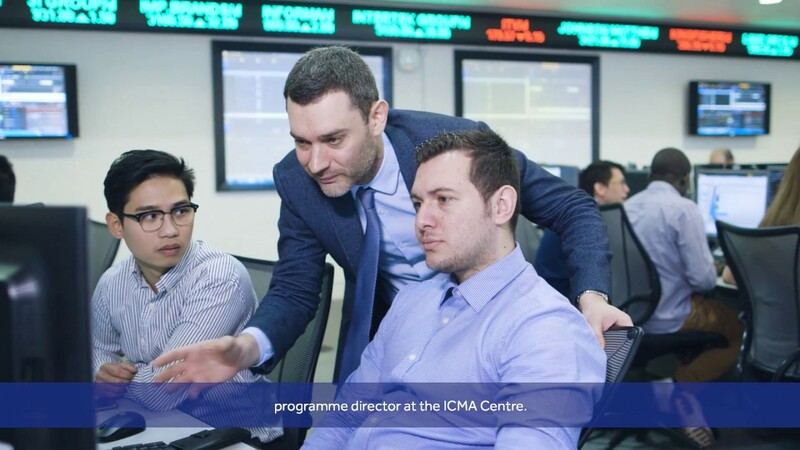 To obtain the requisite knowledge to pass the rigorous FIC exam, students are required to take the ICMA Centre Fixed Income Cash and Derivatives Markets module at Part 2. In order to receive the FIC certificate, students will need to register and pass the FIC exam through ICMA. Further information is available regarding exemptions in MScs and Professional Qualifications. Degree Discipline – Any degree discipline, but must have a satisfactory existing level of numeracy. There are no compulsory modules in part 2 of this course. The module objective is to give students a practical working knowledge of the pricing, hedging and trading of derivative securities, in particular options, via the use of trading simulations and pricing case studies/software. The emphasis of the module is on practical application and it is expected that by the end of the module students will understand and be able to analyse the time/risk dynamics of derivatives in a trading environment. Trading sessions are delivered in our state-of-the-art dealing rooms and utilising our bespoke trading simulation software ICTrader, offering exposure into real trading environment and the price formation process. Students will learn how to “think on their feet”, an essential skill in the investment banking industry. The module provides an introduction to the basic techniques employed in Financial Engineering. Students will understand how these methods can be applied to design securities with desired payoff characteristics. They will be able to evaluate complex security structures by means of reverse engineering and be aware of possible problems when these methods are applied to real world situations. This module is available as an elective to MSc ISIB students as part of a 1-month study-abroad trip during the summer at ALBA Graduate Business School at the American College of Greece, in Athens, Greece. The study fees are covered by the ICMA Centre but the candidates are responsible for their travel, accommodation and subsistence expenses. Student accommodation can be arranged via the American college of Greece at student prices. The principle aim of the module is to provide the students with practical and theoretical understanding of how the financial services industry has been transformed through the adoption and use of digital innovation and information technologies as well as the abundance of data. The module takes both an external perspective on technological and market developments, as well as an internal perspective on organizational transformation and new ways of working for innovation and agility.